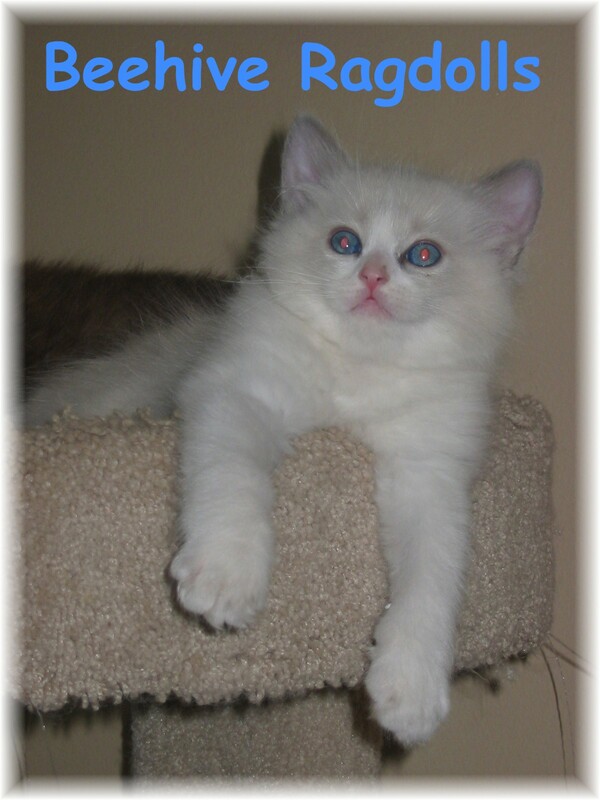 Contact Beehive Ragdolls for more information about available kittens and upcoming litters. Cats and kittens are raised in my home under the supervision of myself, my Golden Retrievers and a Papillon.. I worked in the Veterinary field for over 25 years. I provide all of my pets with the best health care available in order to insure happy, healthy, well adjusted kittens for their new owners. 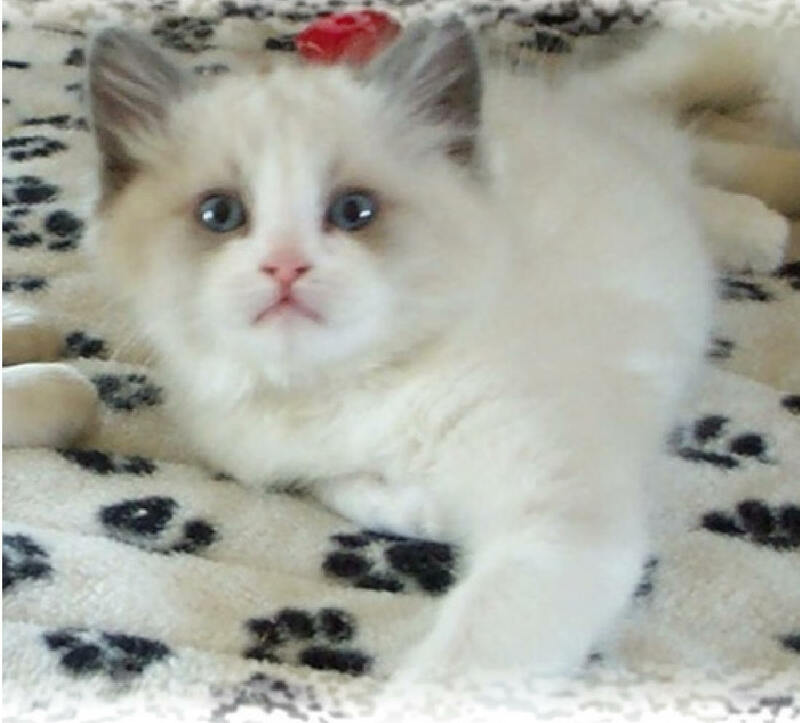 Breeding adults are DNA screened and have appropriate documentation to verify they are negative for hereditary defects common to the Ragdoll breed. Echoglen's Clover Honey of Beehive, "Honey" is a beautiful Blue Bicolor female. She came to me from the Echoglen Cattery in Southern California. My sincere thanks to Laura Nielson for trusting me with this precious kitty and for all of her support. Maryse has retired and is living the Good Life! 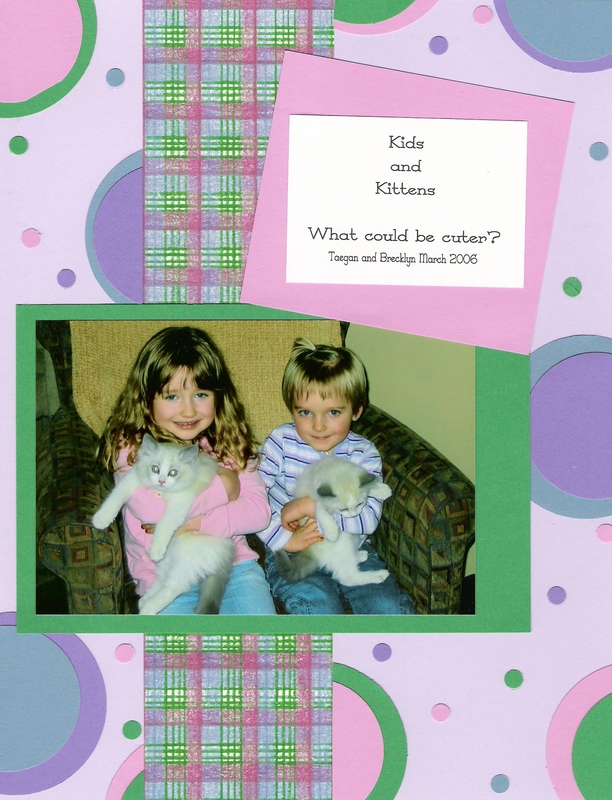 Ragdoll cats are a large, fluffy, laid back breed of house cat. They have a very sweet, calm and affectionate disposition and are devoted companions. Their name is derived from a characteristic of the breed. They tend to go limp, somewhat like a child's Ragdoll when picked up. They are a docile and tolerant pet. 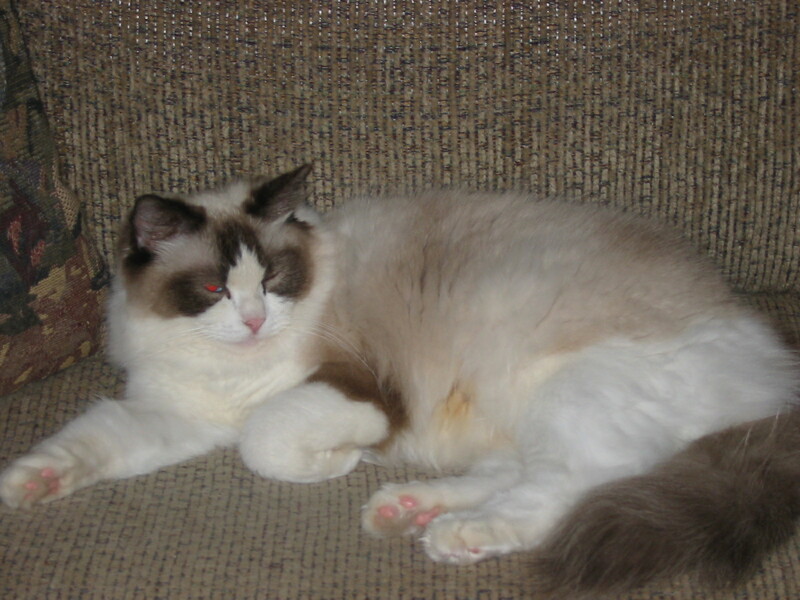 Ragdolls have a glorious soft, medium length, low shedding and non matting coat. It feels somewhat like the fur of a rabbit. 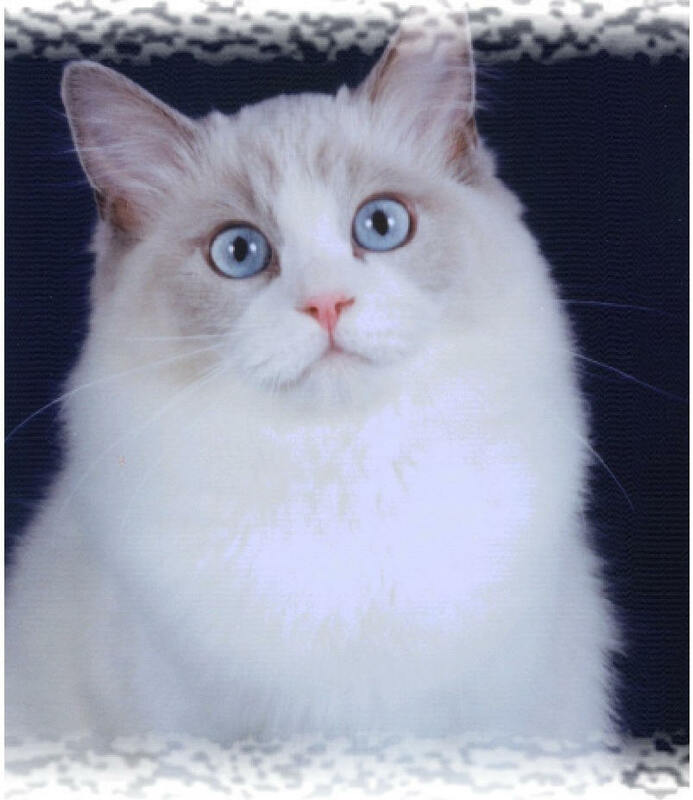 Ragdolls have brilliant blue eyes and an expressive face. They come in a variety of colors and 3 coat patterns. Bicolor : The Bicolor has a dark head with an inverted white "V" on the face. White marking generally starts above the eyes on the forehead and extends between the eyes, over the nose and whisker pads, under the chin and neck. They have a dark tail matching the head and a lighter body and legs. 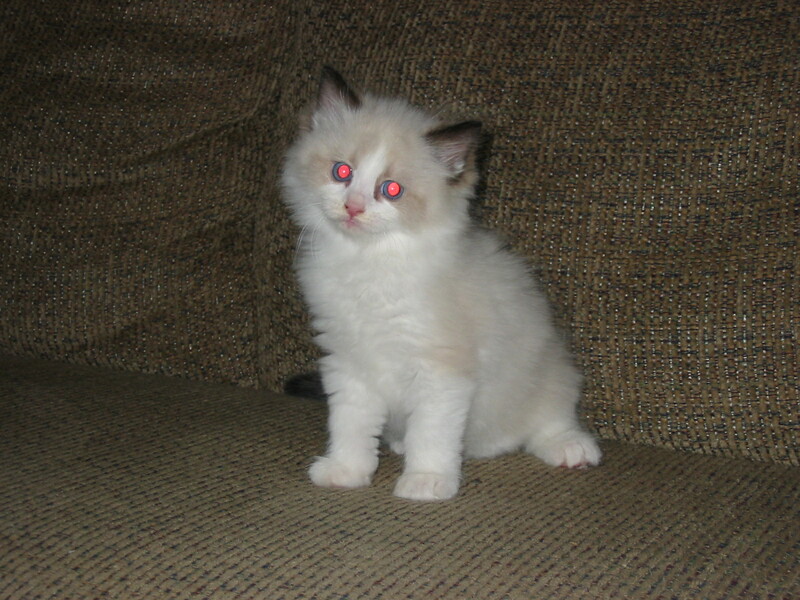 Mitted : The Mitted Ragdoll has coloration similar to that of the Colorpoint but with a white chin. ( It looks as if it has been dipped in milk) They have a lighter colored body, darker tail that matches the head. Darker color coming down the legs and symmetrical white mittens on the front and back feet. 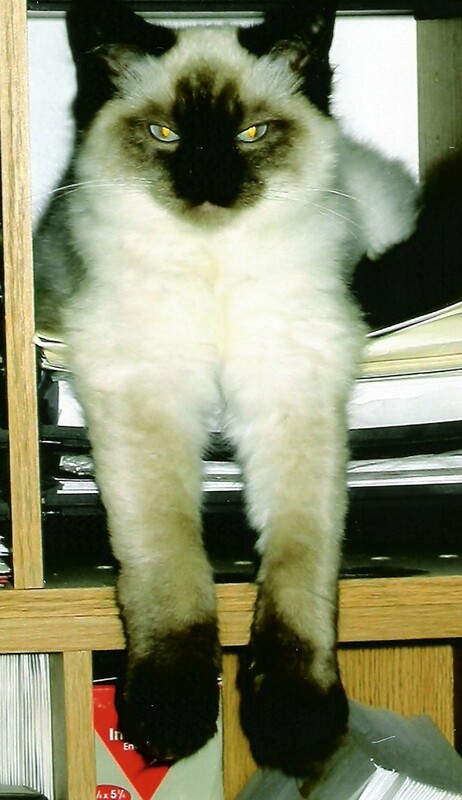 Colorpoint : The Colorpoint has markings like those of the Siamese. Head, face, ears of a darker solid color with a lighter shaded body. The legs and tail are dark matching the head. Ragdolls come in a variety of colors including, Blue, Seal, Chocolate, Flame, Lilac, Tortie, Lynx and Torbie.